Discover the benefit of warm tiles, cost-efficiency and lifelong lasting comfort with underfloor heating. Ideal for all bathrooms, wet rooms and shower areas. 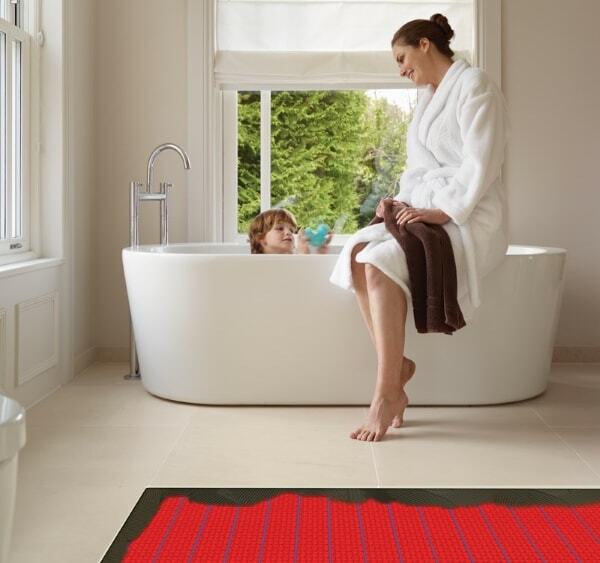 Why Underfloor heating in your Bathroom? 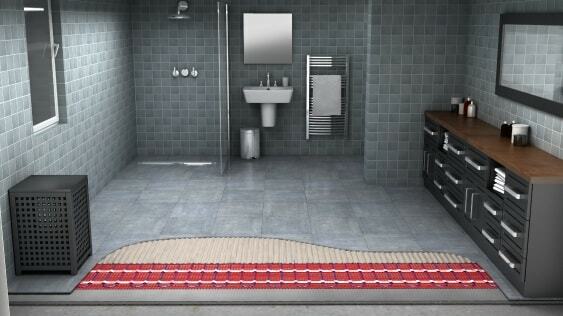 Underfloor heating is increasingly popular in bathrooms and suitable for both new-builds and renovations. 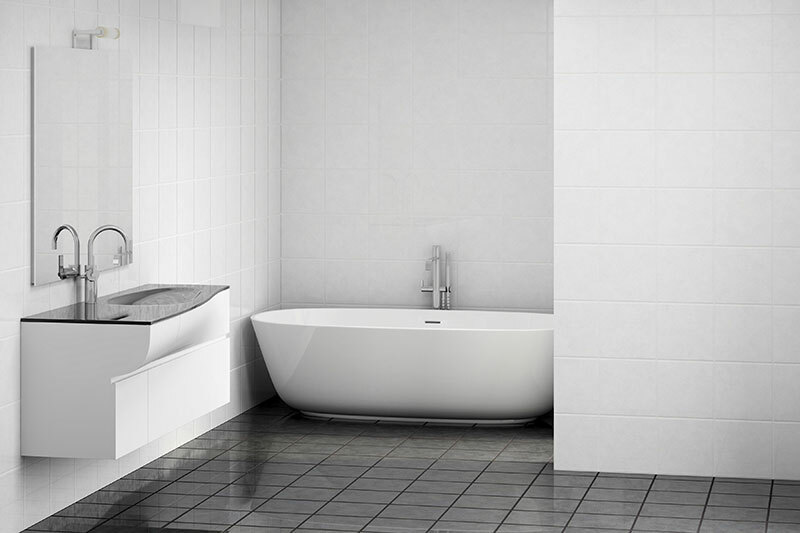 Electric underfloor heating can be installed in bathrooms, wet rooms, and showers for added comfort making it a popular with bathroom refurbishments. No matter what shape or size your bathroom is, Warmup’s wide range of products covers a system that is specifically designed to suit your specification. Learn underneath more about the different systems to find your best solution. Tiles are the most commonly used floor surface in a bathroom. However, not all underfloor heating systems are equally good to be installed with tiles. Tiles are particularly prone to experiencing small cracks and gaps due to the seasonal changes in the subfloor; the subfloor expands during summer and contracts when it is cold. On the back of extensive R&D Warmup has designed underfloor heating systems with different floor surfaces and their specific qualities in mind to not just efficiently heat the floor but to protect it from circumstances such as subfloor movements. Out of all Warmup systems, the DCM-PRO Decoupling System is designed to heat and protect tiles. If your desired floor covering for a bathroom is not tiles, Warmup has a recommended underfloor heating solution for most of the floor types whether stone, wooden, laminate or even carpet. The main consideration before installing underfloor heating is to ensure your subfloor is stable and rigid, preferably with insulation to prevent heat-loss downwards and retain the heat in the room for longer. If insulation is not present, insulation boards can easily be retrofitted, with only minor floor level increase. Installing underfloor heating in a bathroom is far quicker than installing conventional heating systems such as radiators; the wire can be laid directly below the floor finish. Apart from a qualified electrician, no numerous tradespeople such as plumbers are required to finish work first before you can complete the installation of the heater. Underfloor heating can be installed effortlessly prior to the floor finish being laid. The cost of installing electric underfloor heating in a bathroom is generally cheaper than more traditional forms of heating. Floor heaters are also much more energy-efficient than central-heating systems, running at lower temperatures whilst distributing the same level of warmth throughout the room. When using a Warmup system in your bathroom with one of our Smart Thermostats you can also expect to make big savings on your heating bills. Our waterproofing kit is the answer to waterproof a bathroom or shower when installing a DCM-PRO floor heating system. Do check with your local code requirements for compliance. 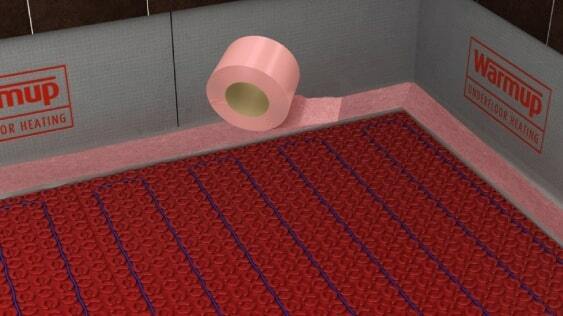 Warmup’s waterproofing tape and corners are recommended in rooms with high moisture exposure. They are comprised of 2 outer polypropylene layers and one inner polyethylene waterproofing membrane and exceed testing requirements per ASTM 118.10. The tape should be applied under the seams of DCM-PRO Membrane and along the walls. Inner and Outer corners are also included in the kit. Mark the locations where the DCM-PRO Membrane will joint and apply the tape with thinset directly to the subfloor. The kit includes a 35ft roll of 5”-wide membrane, along with 2 outer corners and 6 inside corners to complete waterproofing in most common bathrooms under 100 sqft. Enjoy heated floors with complete peace-of-mind, thanks to the Warmup waterproofing kit for residential bathrooms. Underfloor heating can be controlled precisely by a thermostat in individual rooms – this results in lower running costs than centrally controlled heating systems. The Warmup thermostats are designed to measure the floor temperature not only to run the system efficiently but to provide your ideal temperature and a comfortable environment when required. The Warmup 4iE Smart WiFi Thermostat comes with an app that can be downloaded on your smartphone for free and can guarantee a thoroughly automated heating experience while cutting down on your heating bills. Warmup offers a range of bathroom accessories designed to increase comfort and convenience. The bathroom accessories will provide high practicality as much as they add luxury to your everyday life. Enjoy a perfectly warm towel when stepping out of the shower with the Warmup Heated Towel Rail and look into a clear and steam-free mirror with the Warmup Mirror Defogger.